Is San Diego Prepared for Break in Water Supply? Hundreds of miles of canals and pipes deliver water to San Diego every day and NBC 7 Investigates found that while the county is taking steps to prepare for an emergency, one expert said it may not be enough. NBC 7 Investigates gained access to what would become ground zero for San Diego County water officials if there was a terrorist strike, an earthquake or landslide. They also monitor for earthquakes. “Government largely, from knowing what’s in place, is not prepared. 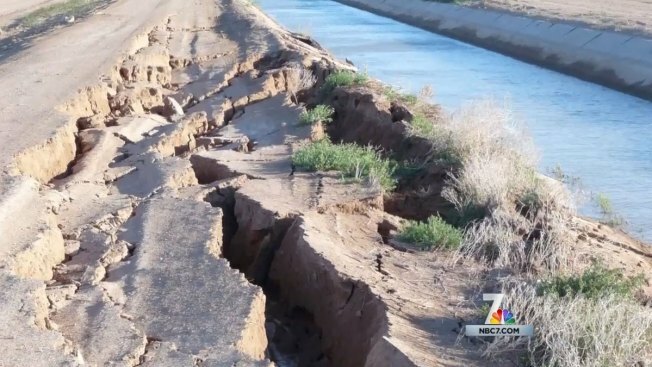 In a major shaking event in Southern California, if one of the major losses is lost, one break, the water is gone. If you break in several places, the water is really gone," said Eric Frost, director of San Diego State University’s Homeland Security graduate program. He also oversees the Viz Center on campus, a communication center for monitoring disasters. In 2010, the Easter earthquake that rocked this region provided a peek at how a major earthquake could impact local water supply. The 7.2 magnitude quake swayed high rises in the county and caused an evacuation at Lindbergh Field. It also challenged the Imperial County Water District and water system. That earthquake didn’t interrupt the water supply for residents, but it caused more than 185 breaks in canals. It took 30 days to repair them all. Eaton said the San Diego County Water Authority is prepared if, and when, there’s an emergency interruption to their system. “In that time based on reports and things, we believe we could affect the repairs within thirty days,” he said. If there was a major disaster, Olivenhaim Dam is one of the places San Diego would turn to for emergency water. According to the County Water Authority, it provides water for 50,000 families for a year. That amount could also supply the entire region with 75 percent of normal water service for 30 days. The dam is the first component of the emergency storage project created by the district. Its pump stations and pipes connect with San Vincente and Hodges reservoirs. The emergency system allows the district to move water uphill and downhill, and it eliminates the need to ask for immediate help from other water suppliers -- a good thing, Frost said. “What do you think of LA’s chances of sending us water with water from LA, if LA has no water? All right guys, San Diego is nice, but not this week," said Frost. According to Frost, local agencies like the County Water Authority tend to do a better job before and after a disaster hits than state and federal agencies. One thing the county water authority says everyone should do is always have a three day water supply on hand. NBC 7 Investigates is working for you. If you have more information about this or other story tips, contact us: (619) 578-0393, NBC7Investigates@nbcuni.com. To receive the latest NBC 7 Investigates stories, subscribe to our newsletter.